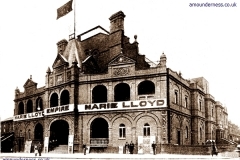 1960s – The building was largely demolished and re-purposed as a cinema and performance venue. 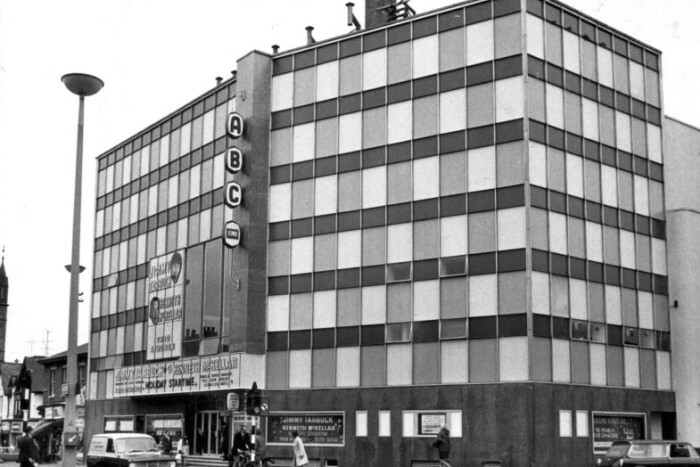 May 31 1963 – Re-opened as ABC Cinema Blackpool, at a cost of £347,000 – mainly cinema use, but live shows in the summer and a pantomime at Christmas. The architect was C J Foster. 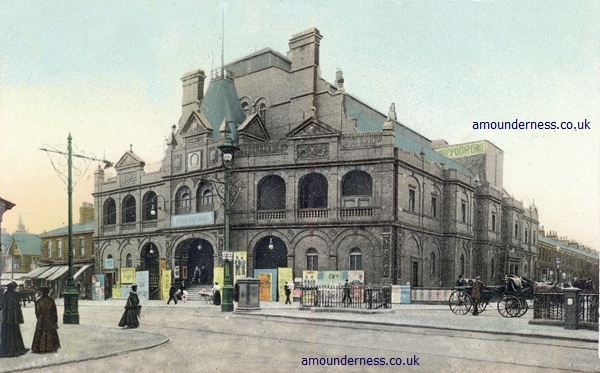 The auditorium consisted of a stalls and deep single balcony with a combined capacity of 1934. The ceiling was lit by hundreds of small individual lamps set in pale gold moulded panels concealing ventilation and sound. Blackpool Gazette article looking back at the ABC Cinema live shows. 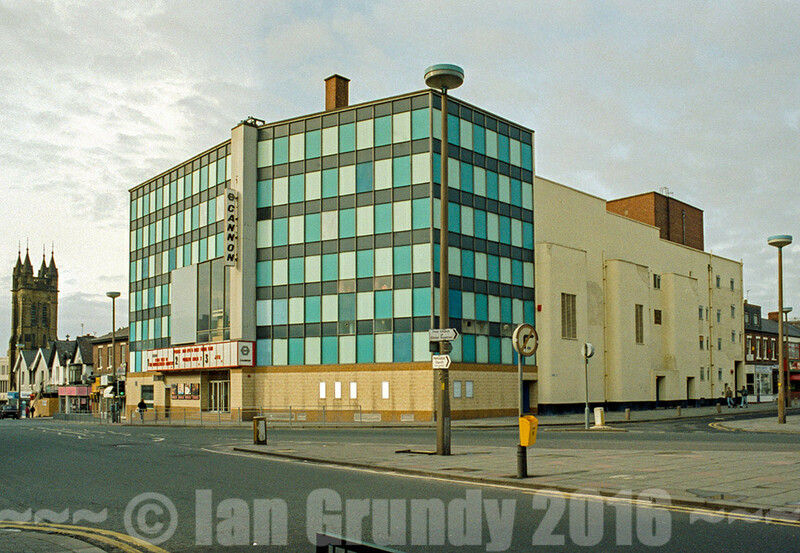 1981 – After many years of theatre usage the auditorium was split into three cinemas, which opened on 30 April 1981. The stage, orchestra pit and original (1963) proscenium and front stalls and dressing rooms all survive behind the screens of 2 and 3. 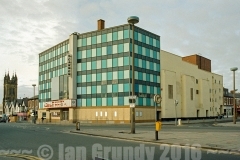 December 1998 – The cinema closed its doors. December 2002 – Re-opened as The Syndicate, the UK’s biggest nightclub, with a capacity of 4,500 people. 2011 – The Syndicate closed. 2014 – 2015 – Demolished – the site is now a car park. 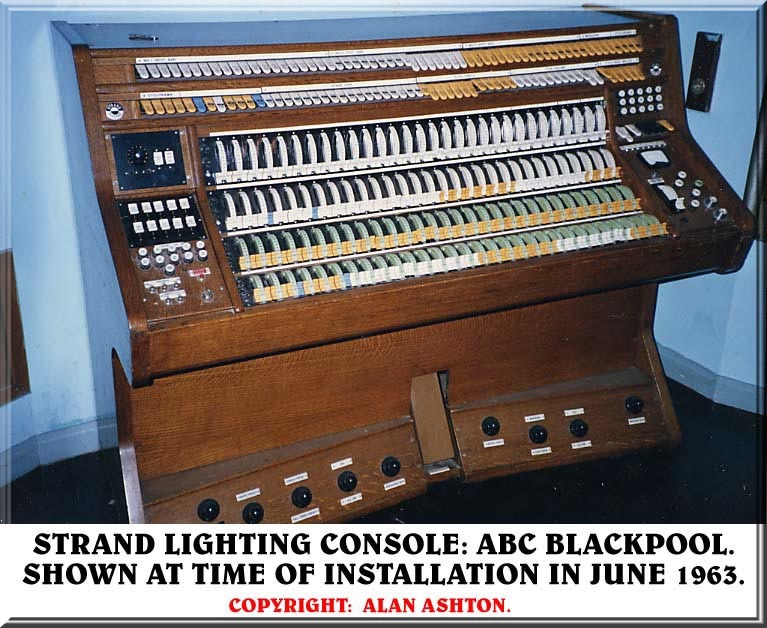 This wonderful console, as installed at the ABC Cinema in Blackpool in 1963, has been rescued and is now on display at Production Park in West Yorkshire. 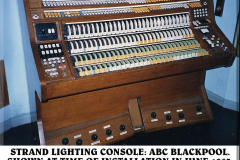 The survey in Tabs 1966 (Vol 24 No.2) confirms the ABC Blackpool System CD controls 120 dimmer channels, with 48 FOH and 72 on stage. There was no patching, and 2 presets (using an electro-mechanical servo-system) and 14 groups. 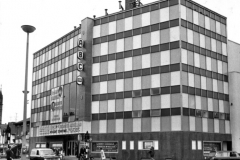 “I had worked for ABC almost from the day I left school: firstly at my home Town of Northampton (Savoy – now the Jesus Centre) and then after RAF Service I returned and was appointed Chief Projectionist at the ABC Wellingborough, Northants. At 21 years of age I was the youngest Chief on the entire ABC Circuit. 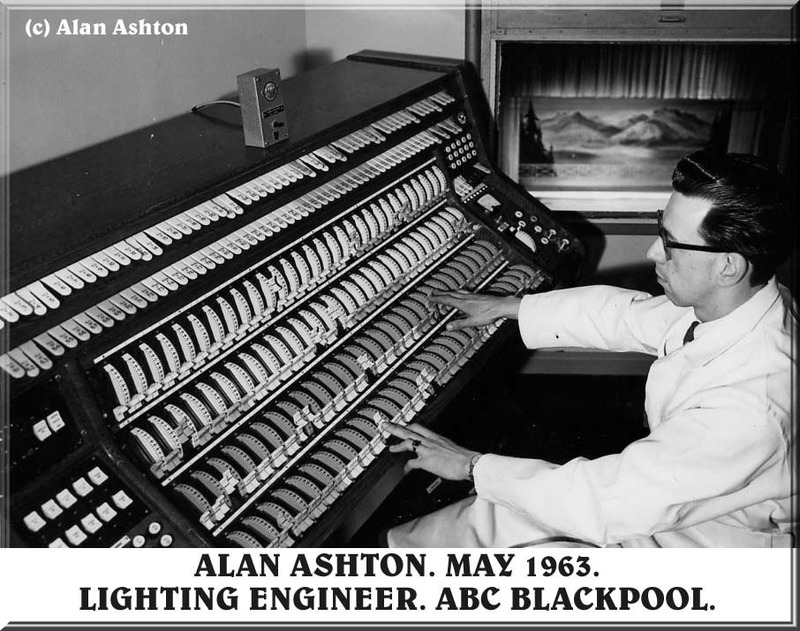 When I heard about the plans for the ABC Blackpool I applied for a position and became Co-Chief Projectionist / Lighting Engineer. The other Co-Chief was the Sound Engineer. 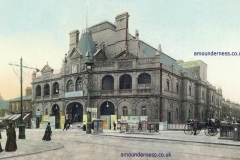 The Strand Board arrived one morning prior to the opening of the theatre. and it was manhandled by 6 of the projection & (visiting) Strand Engineers from street level up to the mid Circle entrance, and then right up to the back wall where there was a huge hole waiting for the console to pass through. The wall was then bricked up and decorated to fit in with the theatre decor. The Sound Engineer had a box sited on the back row beneath the projection room portholes, from where he controlled all the mics and sound levels /tape machines etc for the live shows. The room containing all the lighting switches,circuits and solenoids to actuate them was several floors up above the dressing rooms back stage, but almost in line with the projection room, from where the multi cable from the console travelled across the ceiling void and into this room. 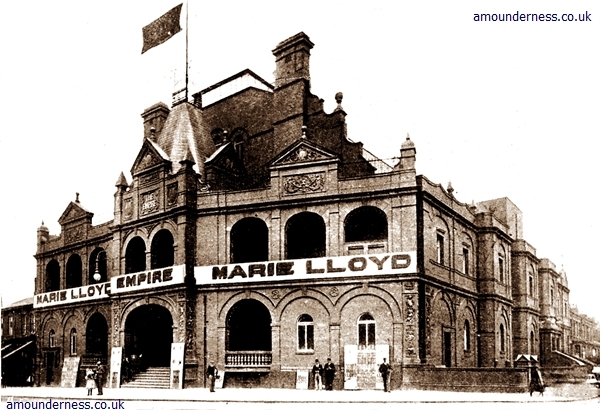 The building was still being knocked about and rebuilt into what was the four exterior remaining walls of the original cinema/theatre (The Hippodrome)and so dust was flying and settling everywhere. The Strand Engineers(I believe one was a Mike Brown) had already spent many days in this switch room installing all the stacks and circuits. The settling dust caused them huge headaches as it got into all the contacts, despite the entire room eventually being shielded in poly sheeting. Came the very first day of rehearsal for the Cliff Richards Show. It had been agreed that prior to rehearsals I would go down to London to Strand and be given tuition on the board. This never happened and so the first time I even saw the Lighting Plot for the show was on the morning of the first rehearsal. The aforementioned Strand Engineer was designated to sit next to me at the console in order to show me what switches, pre-sets etc did and also how to set them up for scene changes and store the settings for immediate re-capture. I set up Scene 1 on the top bank and Scene 2 on the lower bank. On cue I pressed the first pre-set. The Producer of the show got on the intercom and told me to re-check everything as this was not what he had written down. Doubled checked everything and we began again. He called a halt as it was still wrong. The Strand Engineer then took over and set it to the lighting plot. It was still not correct. Rehearsal was cancelled as it was obvious something was wrong. After several hours the fault was traced to the wiring …which at least exonerated me. The Fault? When they wired up the console they did it in reverse. So every time I selected ( for instance ) Tab 1 which should have given me circuit 1…..the switchgear at the other end of the building actuated circuit 200. Tab 2 = 199 / Tab 3 = 198 etc etc. Only one circuit was correct ie: circuit 100 which was half way between the wrong and correct circuits of 200. The entire Lighting plot had to then be re-written showing the the opposite numbers to the original ones. 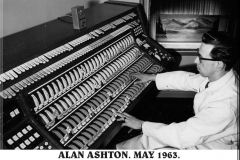 Even when the board was then up and running the dust still permeated the switch room and for the first couple of weeks the Strand Engineer spent his time in the theatre sorting out all kinds of associated problems.